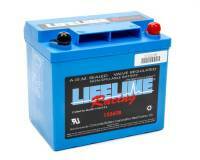 Lifeline Racing Batteries convinced top Military Aircraft suppliers to produce the best racing battery available. Pit Stop USA is The Online Motorsports Superstore! Racers around the world asked for it, you got it! The Lifeline has convinced top manufacturers of Military Aircraft Batteries to produce the best car battery available on the market. 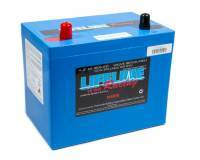 The technology that makes up Lifeline Batteries is simple. Each cell is sealed with pressure relief valves that provide a positive pressure within the battery. The battery"s plates are separated with a micro-fibrous silica glass mat (AGM) that consists of glass fibers of varying lengths and diameters. Lifeline Batteries compact size and high current capability, coupled with a quick charging cycle,and light weight battery construction make Lifeline Batteries the number one choice among top racers and racing teams. Enter the 16 Volt Lifeline Racing Battery! This battery packs a whopping 1050 race cranking amps 1into a 42 pound shell that comes in either 16 volt battery or Combo 16 and 12 volt battery Models. 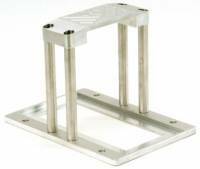 Built to be mounted in a car or truck at any angle and remain leak and spill proof. Many starting problems can be traced to an inadequate solenoid. The Lifeline Heavy Duty Solenoid solves these problems forever. Model 3010 includes a surge protector to prevent a spike in voltage. The Lifeline Racing Battery Maintainer and Charger allow you to run your water pump and electric fans at the track without draining your battery. The 55 amp output regulates voltage flow to prevent overcharging. Both models are ideal for maintaining peak voltage at the track as well as recharging your battery between events. 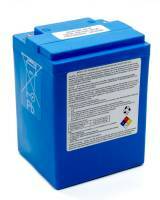 We feature Lifeline Lightweight Racing Batteries, Lifeline 16-Volt Racing Batteries, Lifeline Battery Chargers, and Lifeline Heavy Duty Solenoids at low everyday prices.